It's s not just my kids who start planning their birthday cake months ahead of time, is it? While the whining can be annoying, the benefit is I have months of time to think about how to make a bear cake! Mr 5 received a Little Charley Bear for his first birthday and it has been his constant companion ever since. He's only spent one night apart from him, and that was when he accidentally left him at daycare and I didn't even know he'd taken him there. We survived the night. Just. But it's not an experience I would care to repeat. So when he asked for a bear cake for his 6th birthday, I knew I would have to make it a Little Charley Bear cake. How could I not? I always make my kids birthday cakes even though cake decorating is not my strength, and of course these days we avoid artificial colours and flavours like the plague which makes the more brightly coloured cakes a bit of a challenge. Good thing bears are brown! First thing was to find an image I could use as a template. 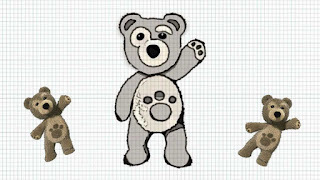 There are surprisingly few Little Charley Bear colouring pages online, which is basically what you are after. 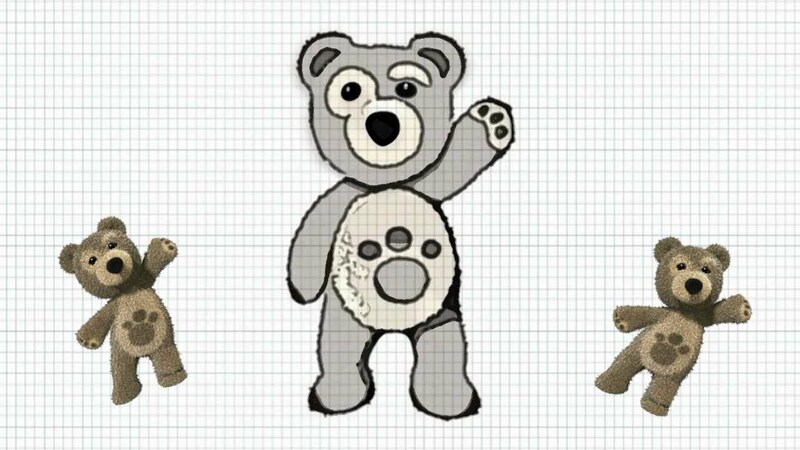 What I found was a still from a You Tube video called 'How to draw Little Charley Bear.' Perfect. I saved the image, cropped off the bears on the sides and pasted it into PowerPoint. My cake tin measured 33cm long so that was the maximum size for the image. Enlarge the image to 33cm, then copy it onto 2 slides - one with the top half and one with the bottom half. Then print out both slides and tape them together to form one 33cm high image. 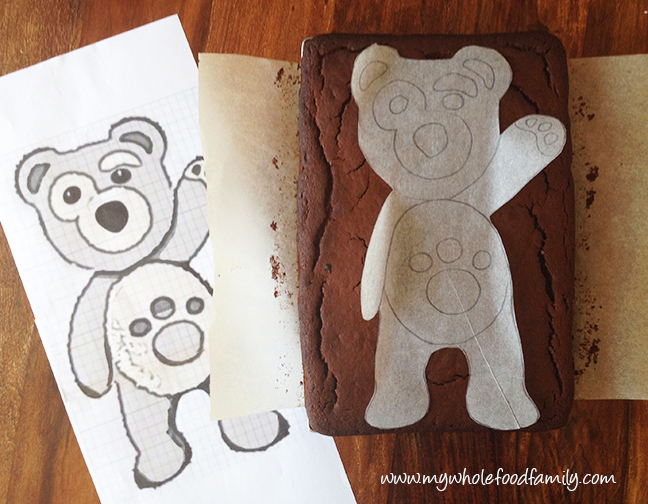 Lay a sheet of baking paper over the top and trace the outline and details with a sharpie. Lay the template over your cake and using a sharp knife at 90 degrees, carefully cut around the edge, holding it with one hand to prevent it slipping. Carefully slide your cake onto a prepared cake board and you are ready to decorate! Preheat oven to 170 degrees Celsius / 150 degrees fan-forced. Grease a 23 x 33cm tin and line the base and sides with baking paper. Cool in the tin for 5 minutes before turning out onto a wire rack to cool completely. Cover with a tea towel to stop it drying out. Beat together the cream cheese, butter, coconut sugar and vanilla together until smooth. Remove about 1/4 of the icing and set aside in a small bowl. This is for all the light coloured parts on the tummy and eyebrow. Remove 1 tablespoon of this icing and place into another small bowl, this will be for the brown inside the ears. Add the cacao to the rest of the mixture and mix until smooth and completely combined. 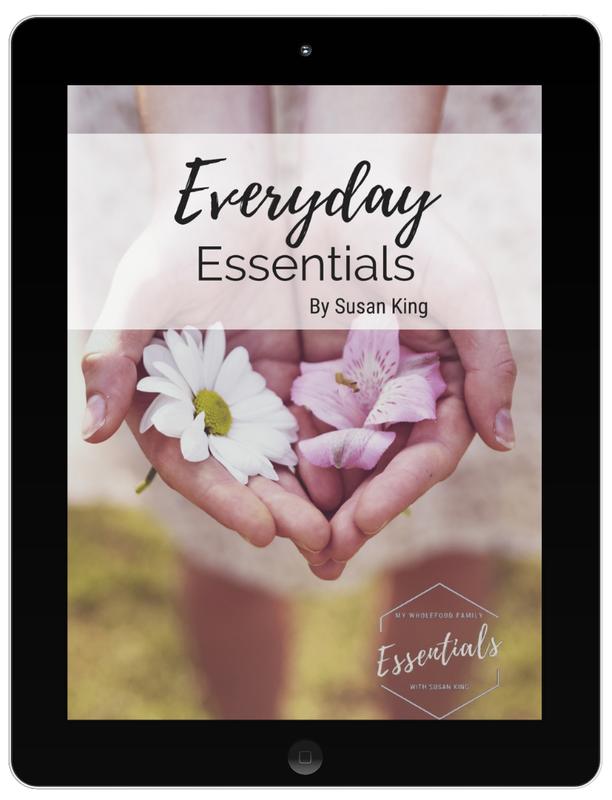 Place 2 tablespoons of this mixture into a small bowl and add the contents of the charcoal capsules - mix until well combined. You should have a strong black icing. Take a small amount of the black icing and add it to the tablespoon of light icing set aside - add little by little until you get a darkish grey-brown. This is for inside the ears. Prepare your template and cut out the cake as per instructions above. Place the cake onto your prepared board. I use a large cake board covered with wrapping paper. Cut strips of baking paper and slip them under the edges of the cake. This keeps the board clean while you ice the cake. Just pull them away when you are finished for nice crisp edges and a clean board! Cover the whole cake, top and sides, with a thin coat of the chocolate icing. This is the crumb coat and it seals in all the crumbs and gives a better finish. Place the cake in the fridge for 20 minutes for the icing to firm up before moving on to the next step. Now you need to cut out each element from the template. Starting by cutting out the light colour tummy. Lay it on the iced cake and using a skewer trace around the edge. Fill in with light coloured icing. 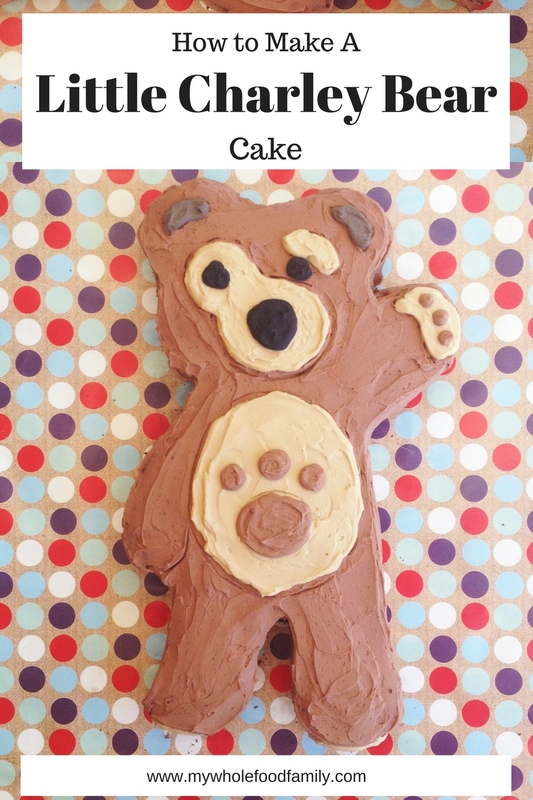 Repeat with the smaller pawprints on the tummy and fill in with chocolate icing. Repeat for paw and ears, and use black icing for the nose and eyes. Serve immediately or if you need to put the cake in the fridge, bring it out an hour beforehand to warm up. 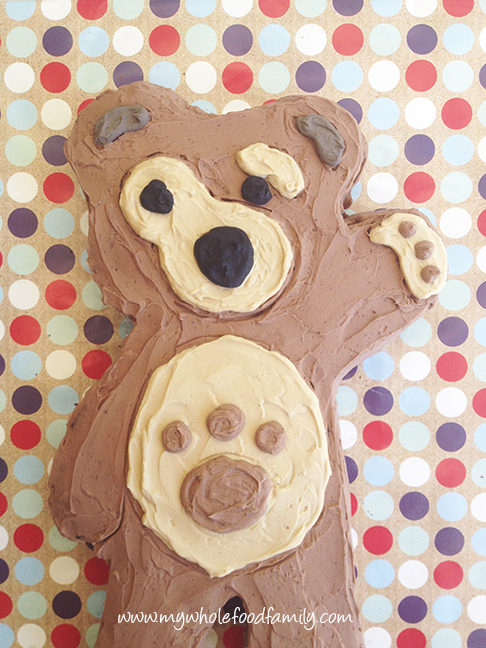 If I can make a Little Charley Bear cake, anyone can! And free from refined sugar and artificial colours.